Agile software development takes a different approach to delivering software than what you might initially expect. Instead of delivering a fully complete software product at the end of your project, the agile methodology focuses on building and delivering software in smaller increments, called iterations, every couple of weeks, ultimately building toward a completed product. Agile software development prioritizes features, continually gathers customer feedback and adjusts and remains “agile” and flexible throughout the process, knowing that during the process new insights may occur that may lead to valuable changes. We create a list with our customers, known as a “project to-do list” or “product backlog” that defines each of the individual features and software requirements for the proposed system. Using Agile estimation techniques, we roughly estimate the effort for each task using a points-based system. We assign each task a value of 1, 2, 3, 5, 8, 13, or 21. These points do not represent hours, but instead represent perceived effort based on experience with similar tasks in the past. Next, we propose a number of tasks to complete over the coming 1-2 week period (called a sprint) which will total up to a certain number of points. At the end of the sprint, we conduct a show and tell with the customer, in order to show what’s been done and how many points were completed, to gather feedback and discuss any issues and to plan out the next 2 weeks of tasks. At the end of the sprint, we also conduct an internal meeting, known as a “retrospective”, where each member of the team reviews what went well, what didn’t work well and what can be done to improve the process going forward. Using the points based system, over a period of time, everyone involved in the project gets a much better sense for task size and how many points can realistically be completed per sprint (known as the project velocity) and this can be used to track progress and estimate the timeline more accurately. Note: When you ask developers to estimate in hours, you typically get either a very conservative, padded estimate or an overly optimistic, unreal estimate. Using a points-based system grounds tasks in a greater sense of reality, by comparing tasks directly to other tasks recently completed. If during a sprint, a particular task was overestimated, leaving the team with more time, the next task(s) on the list can be picked up and completed. Conversely, if a task was underestimated, the team has learned that similar tasks may take longer and can now adjust the points assigned to those tasks to more accurately represent their true size. As this process continues, teamwork improves and the project velocity can be more accurately predicted leading to a much more realistic sense of the timeline. These insights also allow everyone to make better decisions about whether the timetable should be extended or contracted, which tasks must be done, which ones might be put on hold and whether the scope of the project should be increased, decreased or remain the same. It won’t take long working with the Agile software development methodology to realize it’s very different and in a good way. When you work on an Agile project, analysis, coding, design, and testing never really ends. The traditional waterfall method of software development frequently failed in its attempts to define everything upfront and estimate costs and hours in a virtual black box. The Agile method acknowledges that this is not a real-world representation of how things are built and instead focuses on shorter periods of time and works on continual improvement and continuous feedback to achieve better, faster and more inexpensive results. 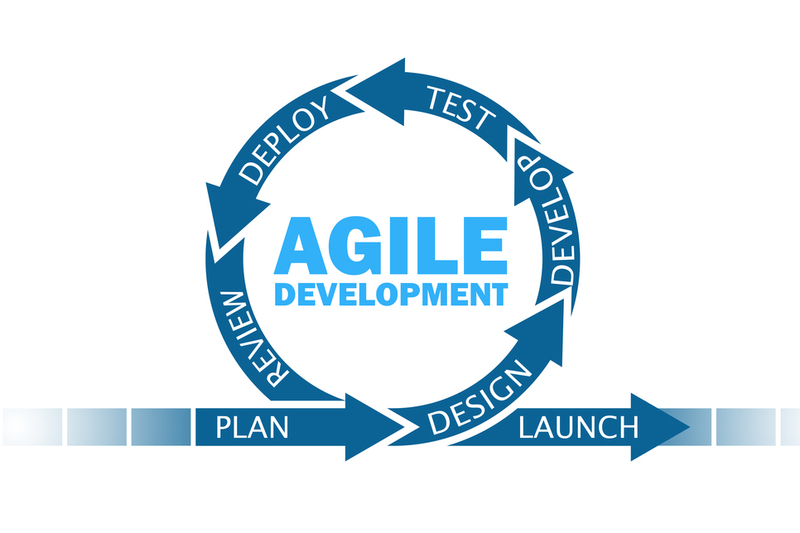 Agile provides the flexibility to constantly adjust to new information and tweak the product so as to produce the best possible product. Another benefit of Agile software development is that it helps to make each person’s role in the project more flexible. It can feel more like working in a start-up because participants do whatever is necessary for the good of the project without the restriction of a narrow role definition. Previously defined roles such as analyst and programmer cease to exist in the traditional sense and all participants can voice their opinions, challenge the approach and provide input and solutions for the good of the product. Conventional software development can lead to dysfunctional teams with competing self-interests. This results in missed deadlines, burnout and high turnover. Agile helps teams to maintain integrity and work for the greater good, while providing greater project flexibility. How Does Agile Compare to Waterfall Method? Traditionally, the Waterfall method of software development defines four distinct phases in a software project. These include analysis, design, code, and test. This methodology is effective when costs are very high to change mid-project, as one could imagine in a typical manufacturing facility. However, in modern software development, the costs to change and adapt is much lower and in the age of rapid change that we are living through, not changing or adapting to new information and inputs will likely result in product failures. When you consider the four phases of Waterfall, and you are dealing with a fixed budget, as the budget gets used up, something has to give. If critical features were scheduled toward the end of the project, these features could be in jeopardy unless the budget is extended. Also testing is likely to be reduced, leaving the product vulnerable to bugs and poor quality. With waterfall, it’s also harder to determine how far along you truly are at any given point in a project since the Waterfall methodology doesn’t produce working software until you’re almost near the end. What can often happen is that you end up running out of budget before you have functioning software which can be catastrophic. With Agile, you’re getting functioning software all along. Waterfall simply doesn’t adapt well to change when you compare it to Agile. Rather than use four fixed stages, Agile continuously works on delivering software right away and works at improving product and process quality from the first day of the project. Agile reduces risk because feedback is acquired early and often and integrated into the product. Customers can request changes without having to worry about paying a high cost to do so. Who Uses Agile Software Development? According to a recent poll by InfoQ, Agile methodology enjoys widespread acceptance and adoption. Companies using Agile software development report improvement in product quality and customer satisfaction as well as a decrease in the time it takes to bring a new product to market. While originally exclusive to IT departments, the Agile approach has expanded to other traditional businesses such as Apple, Tesla, SpaceX, Amazon and many others because it recognizes and adapts to an ever quickening world. Since 2003, ClearTech Interactive has helped customers with their mobile app and custom web development needs. Now that we have answered the question “What is Agile software development?” we’re prepared to apply it your project for the highest quality and most efficient results. We look forward to learning more about your business ideas during a personal consultation. If you have a project you’d like to discuss, please contact us online or call 727-562-5161 to get started. This entry was posted in Mobile Apps, Web Development. Bookmark the permalink. ← What is Organic Search Traffic?